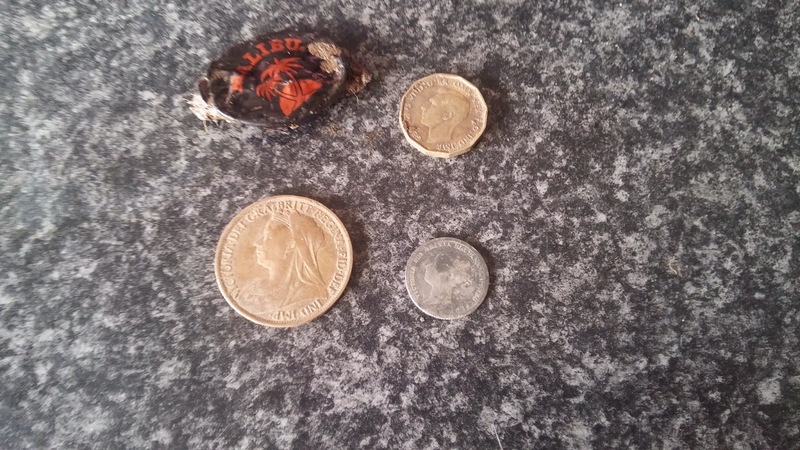 Andy's treasure hunting cafe and metal detecting blog: A little silver and a broken metal detector plus metal detecting video. A little silver and a broken metal detector plus metal detecting video. I took another trip out today to my usual pasture permission in the hope of getting some more cracking finds as this field has produced me with some of the best finds I have had to date. I thought I would experiment this morning by using my Cscope 4pi pulse induction beach detector. I had originally hoped it would allow me to get a lot better depth on this field and I though there was very minimal iron to cause any problems, I was wrong though. As it turns out that the field has loads of iron signals but i had forgot i had been using the Teknetics eurotek with its iron audio feature switched on so just had not noticed had much iron there actually was. I dug several deep nails at around a foot down and had soon got fed up and made the ten minute walk back to the car to get the other metal detector. I managed a few nice coins, one being a silver Victorian sixpence and some bottle tops but my detector seems to have developed a fault. It is falsing like crazy and i dug multiple holes that produced no finds. In the end i got so frustrated with it that i had to admit defeat and surrender. It was still a pleasant couple of hours and more nice coins to add to my collection. There is a link to the YouTube video here if you fancy a watch. Please feel free to subscribe to my videos as it is free but inspires and motivates me to make more. Today's metal detecting finds minus nails. Good vid Andy and nice coins in lovely condition. I once tried the cs4pi inland and like you I gave up after half an hour, way to much digging. Hope you get your machine sorted. Not quite on topic, but this is too good to miss. Have a look at the Komrade's Krappy blogski. He's had his nose rubbed in it again, by a detectorist who made him remove a photo 'Pavel the Red' had used on his blog taken from SEARCHER. The like a spoiled child, he put up another with an anti-American sentiment underneath. Have a look at the latest from Heritage Action. Jeez, that pillock sails close to the litigation wind. Some metal detecting odds and ends.